Deforestation is the removal of trees in a forest where the land is thereafter converted to a non-forested land, entailing a potential threat to the health of terrestrial and aquatic ecosystems. The removal of trees without sufficient reforestation has led to unfavorable consequences, including loss of habitat, loss of biodiversity, and poor soil quality. Changes in soil chemical properties due to deforestation considerably decreased the levels of soil nutrients, pH and available phosphorus, since the lowering of soil pH alters nutrient availability and thereby affects plant growth and productivity in highly acidic soils (Zaman et al., 2010). Phosphorous (P) has been recognized as a major limiting nutrient for sustaining the productivity and resilience of terrestrial ecosystems (Poeplau et al., 2016; Vásconez et al., 2018), and the availability and chemical form is very sensitive to changes in soil pH. In acidic soils Al3+ and Fe3+ react extensively with phosphates (H2PO4 - and HPO4 2-) to form insoluble Al and Fe phosphate compounds (Ro and Cho, 2000; Verma et al., 2005; Redel et al., 2016), while in neutral and alkaline soils Ca2+ readily reacts with phosphates to form less insoluble Ca-P compounds (Lindsay, 1979). However, recent evidence suggests the possibility of conversion of Ca-P compounds into even more insoluble compounds, decreasing their solubilities (Mahdi et al., 2012). In general, liming is known to increase the availability of P in acidic soils by stimulating mineralization of soil organic P pools (Haynes, 1982; Sharma et al., 2013). However, another line of investigation suggests that liming decreased soluble-P and labile-P until the pH reached about 6.5 (Delgado and Torrent, 2000), thus indicating the occurrence of chemical disturbances in the early stage of liming, contrary to the widely-held notion. This contrasting effect of liming obviously suggests that the solubility and interaction of each P compound predominantly governs its availability and chemical speciation in soils (Haynes, 1982; Mahdi et al., 2012; Saleem et al., 2017), and that the patterns of partitioning and chemical speciation of P would vary with time. Liming with CaCO3 or CaSO4 is an effective way of increasing the soil pH of acidic soils, and has two major effects on the soil chemical status, since it adds a large amount of Ca ions (Fransson et al., 1999). Liming however, can reduce the availability of P in soils due to extensive interaction of P with Ca2+, Al3+ and Fe3+ ions (Machado and Silva, 2001), thus causing a shift in ionic composition. The changes in ionic composition due to changes in soil pH can in turn lead to a shift in chemical equilibria by increasing concentrations of dissolved Ca2+ and displaced hydrolytic Fe and Al species (hereafter, be referred to as Al3+ and Fe3+, respectively) that can decrease the availability of P in the soil solution (Ro and Cho, 2000). Since these reactions involve large number of chemical forms of P in soils, which are bound to metals or free cations and differ in their mobility and availability, the different P species, such as labile P, reductant P, and metal-bound P, coexist. Thus, the distribution of P species can be separated by different sequential extraction schemes, the so-called P-fractionations (Chang and Jackson, 1957; Kaiserli et al., 2002). Nevertheless, the mechanism responsible for variations in P chemical speciation in soils due to liming is still not fully understood. Although a large majority of efforts has been so far directed to long-term effects of liming on the chemical P speciation (Patzold et al., 2013), too little attention has been paid to relatively short-term effects right after liming. And the time-dependent relative thermodynamic stability and the kinetics of interconversion from various P compounds are also required. Moreover, a chemical disturbance caused by liming in turn triggers complex chemical reactions in which a large number of chemical interconversions among P compounds occurs. The series of sequential or parallel interconversion reactions that determines inorganic P speciation processes however, are still unresolved because of insufficient data or information on the Gibbs free energy of formation or the equilibrium constant for each binary combination of P compounds. In addition, some recent evidence suggests an inconsistency in the effects of liming on the distribution of Ca-P species and the availability of P (Machado and Silva, 2001; Mahdi et al., 2012). This situation necessitates a testing of the possibility of conversion of Ca-P compounds into less soluble compounds and/or concurrent formation of Al- and/or Fe-P compounds in order to bridge the knowledge gap for the effect of liming at least in the early stage of chemical disturbances. Therefore, we challenged the widely-held notion that P availability increases due to liming by hypothesizing that an increase in soil pH induced by liming would instantaneously disturb chemical equilibria among inorganic P species through extensive interactions with increased Ca2+ due to dissolution of CaCO3 and with displaced Al3+ and Fe3+. Here, we tested this hypothesis by conducting batch incubation experiments and determined the time-course distribution patterns of chemical P species by sequential P extraction and X-ray diffraction analysis. As evidenced by recent evidence of decreasing P availability and solubility (Machado and Silva, 2001; Mahdi et al., 2012), the response of the speciation and availability of P to liming practices should be reevaluated, particularly for forest tree nurseries for reforestation and forest management. The study site was located in the Seoul National University Forest, Mt. Backwoon, Jeollanam-do (35º2'N, 127º35'E). The deforestation site was clear-cut 5 years ago, mostly to allow cultivation of pitch pine (Pinus rigida Mill.). Soil samples (0-30 cm in depth) were taken in February 2012. Immediately after sampling, soil samples were air-dried at room temperature, passed through a 2 mm sieve, and mixed thoroughly. 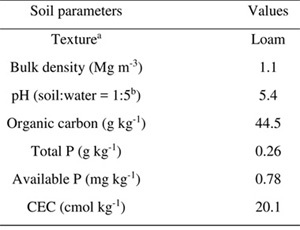 The physical and chemical properties of the soil were shown in Table 1. Lime requirement was determined by the incubation pH buffer curve method (Kuo, 1996). One hundred grams of an air-dried soil sample was placed into each of seven separate 250 mL Erlenmeyer flasks, and these samples were adjusted to field moisture capacity (0.31 m3 m-3) and mixed with calcium carbonate (0, 0.1, 0.2, 0.3, 0.5, 0.7, and 0.9 g). Each mixture was sealed with Parafilm®, and was shaken at 120 rpm at 25±2 ºC for 5 days. The soil was then dried at room temperature. The soil pH was measured potentiometrically in a 1:5 (w/v) soil:water suspension using a pH meter (Orion 3 star, Thermo Scientific, NH, USA). The pH data were used to draw a pH buffer curve to obtain the lime requirement values for the desired target pH. In order to investigate the liming effect on the pH and P fractions on deforestation soil, 100 g of soil sample was transferred into 250 mL plastic bottles, and a total of 45 bottles were prepared for three treatments (control and adjustments to pH 6 and 7) in triplicate with 5 destructive samplings. The soil samples were split into three treatments: a control and two lime-treated soils (adjusted to pH 6 and 7, respectively), and each treatment group was pre-incubated at 25±2 ºC in the dark. The deforestation soil was limed to the target pH by adding laboratory grade, powdered CaCO3. The soil water content was adjusted to 0.31 m3 m-3 (field capacity). After pre-incubation, two lime-treated soils were mixed with either 0.1 g CaCO3 (referred to as low CaCO3 or LCC) or 0.4 g CaCO3 (referred to as high CaCO3 or HCC), and these two terms represent adjustments to pH 6 and 7, respectively. The bottles were incubated at 25±2 ºC for 40 days. The soil water content was adjusted to maintain the field moisture capacity during the 40-day batch experiment by adding deionized water to the bottles as necessary to maintain their initial condition. Triplicate soil samples for each treatment were prepared for analysis of the chemical properties at 0 (5 hours), 1, 10, 25, and 40 days of incubation. Soil samples were air-dried at room temperature, passed through a 2-mm sieve, mixed thoroughly, and analyzed for soil pH, total-P, organic-P, available-P, inorganic-P and exchangeable Ca2+, Al3+ and Fe3+. The soil pH was determined in a 1:5 (w/v) soil:water suspension using a pH meter (Orion 3 star, Thermo Scientific, USA). Total P was determined by the ammonium paramolybdate-vanadate colorimetric method after a perchloric acid digestion (Kuo, 1996) using a UV-visible spectrophotometer (UV-1601, Shimadzu, Japan). Organic P was determined by the ignition method (Saunders and Williams, 1955), and available P was determined by the Bray-1 procedure (Bray and Kurtz, 1945) using a UV-visible spectrophotometer. The inorganic P was partitioned into three chemical fractions (Fraction-A, Fraction-B, and Fraction-C) according to Fractionation procedure (Chang and Jackson, 1957). Fraction-A denotes the NaOH extractable P fraction (a mixture of Al-P and occluded Fe- P) that is obtained from soil extracts with 1 M NH4Cl + 0.5 M NH4F + 0.1 M NaOH. Fraction-B denotes the citrate-dithionite-bicarbonate extractable P fraction (a mixture of non-occluded Fe- P and adsorbed-P) that is obtained by adding 0.3 M Na3C6H5O7 + 1 M NaHCO3 to the residue and heating the suspension in a water bath at 85 ºC and then adding 1 g Na2S2O4. Fraction-C is referred to as the H2SO4 extractable P fraction (Ca-P) that is separated by adding 0.25 M H2SO4 and shaking for 1 h. Saturated NaCl was used to wash the residue twice after each extraction step. The P concentrations in each fraction were determined by the ascorbic acid method (Murphy and Riley, 1962). The unaccounted-for P was calculated from the difference in total P and the sum of inorganic P fractions. Exchangeable Ca was obtained by the 1 M ammonium acetate (pH 7) method (Sumner and Miler, 1996), and exchangeable Al and Fe were obtained by the 1 M potassium chloride, nitric acid method (Bertsch and Bloom, 1996). These exchangeable cations were measured using an ICP-OES (inductively coupled plasma-optical emission spectrometer, ICPS-1000IV, Shimadzu, Japan). To predict the time-course interconversion processes from the thermodynamic data and the presence of the crystalline P compounds available in the literature, the mineralogical composition of soil samples collected at a given time was analyzed using a Bruker AXS D8 ADVANCE with a DAVINCI design X-ray diffractometer (Cu Kα radiation with a λ of 15.418Å), equipped with a 3-circle goniometer. Samples were step scanned between 5 and 90º (2θ) with an increment of 0.02º and a 1 s counting time per step at room temperature. The mineralogical composition of a soil sample was identified by using the Bruker DIFFRAC plus software with the Joint Committee on Powder Diffraction Standards (JCPDS) PDF-1 and PDF-2 databases. Data were analyzed using the General Linear Model procedures (SAS Institute, Version 9.3, Cary, NC, USA). The effects of two factors (CaCO3 treatment and time) and interactions on pH, total-P, organic-P, available-P, inorganic P fractions, and exchangeable cations were evaluated. A two-way analysis of variance (ANOVA) for a completely randomized design with three replications was performed to test for significant differences among the treatment means within a factor and for interactions between factors. The least significant difference (LSD) test at a confidence level of p < 0.05 were used to separate means. The calculated p values for the two main factors and the interaction were shown in Table 2. Table 2:Results of two-way analysis of variance (ANOVA) showing the p values for pH, Total-P, Organic-P, Available-P, Inorganic-P and exchangeable cations as affected by CaCO3 treatment, incubation time and their interaction. 3.1. Effect of liming on P measures and exchangeable cations. 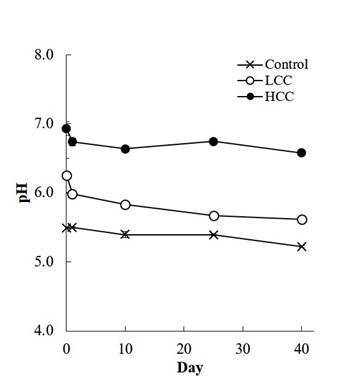 The soil pH initially increased up to 6.9 for the HCC treatments and 6.3 for the LCC treatments as compared with control soils (pH of 5.5), and then quickly decreased to 6.7 for the former and 6.0 for the latter within 1 day of incubation (Figure 1). Total-P and organic-P of incubated soils did not change significantly in control and CaCO3-treated soils (Figures 2A and 2B). The concentration of available-P was lower in CaCO3-treated soils than in control soils (Figure 2C), showing a negative relationship between liming and available-P in this study. However, the levels of available-P did not differ between the CaCO3-treated soils. Figure 1: Temporal variations in the soil pH during batch incubation. Error bars indicate ± standard deviation. Figure 3: Temporal variations in the concentrations of exchangeable (A) Ca2+, (B) Al3+ and (C) Fe3+ during batch incubation. Error bars indicate ± standard deviation. 3.2. Effect of liming on inorganic P speciation. The levels of Fraction-A in CaCO3-treated soils peaked at 10 days of incubation, and then decreased below control levels at 40 days (Figure 4A). The initial sharp increase in Fraction-B for CaCO3-treated soils within a day of incubation abruptly decreased at 10 days of incubation, and gradually increased thereafter (Figure 4B). 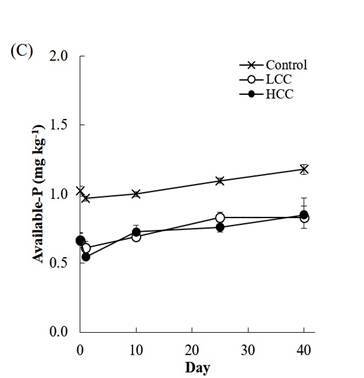 During incubation, the levels of Fraction-C were lower in CaCO3-treated soils than in control soils (Figure 4C). Figure 4: Temporal variations in the concentrations of inorganic P fractions during batch incubation: (A) Al-P + occluded Fe-P, (B) non-occluded Fe-P + adsorbed-P and (C) Ca-P. Error bars indicate ± standard deviation. The mass-balance distribution of the unaccounted-for P, which was not recovered by the sequential P fractionation procedure adopted herein, was calculated by subtracting the sum of inorganic-P fractions from the initial amount of total-P at each sampling time (Figure 5). 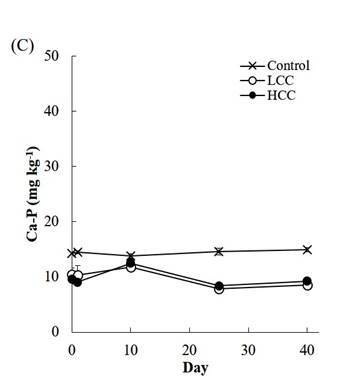 Compared with control soils, the addition of CaCO3 decreased the portions of the unaccounted-for P during the early incubation (10 days of incubation) as consequences of the initial increase in Fraction-B and the subsequent increase in Fraction-A. At the end of incubation, however, the unaccounted-for P in CaCO3-treated soils increased as a result of the concomitant decreases in Fraction-A and -C, although the portions of Fraction-B slightly increased. The addition of CaCO3 also decreased the portions of available-P (Figures 2C and 5), but did not affect those of organic-P. Figure 5: Time-course mass-balance distribution patterns of organic P, available P, Al-bound P + occluded Fe-bound P, non-occluded Fe-bound P + adsorbed-P, Ca-bound P and unaccounted-for P fractions in soils as affected by the addition of CaCO3. Compared with control soils, despite the relatively weak intensities of the peaks, liming obviously induced the conversion of Al-P compounds from crystalline to amorphous phase within a day of incubation and the subsequent formation of crystalline AlPO4 (berlinite) and its conversion into another crystalline hydrated Al-P compounds (Figure 6). 4.1. Effect of liming on P measures and exchangeable cations. 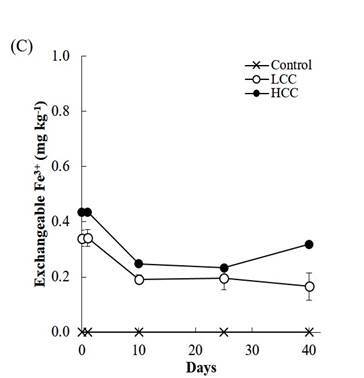 Compared with control soils, the pH initially increased in CaCO3-treated soils, and then quickly decreased within 1 day of incubation (Figure 1). In general, the extent of the increase in soil pH due to liming varies with soil buffering capacity, exchangeable ions such as Al3+ and Fe3+, and the equilibrium reactions among the inorganic P fractions (Hsu, 1964). Chaplain et al. (2011) ascribed the subsequent decrease in soil pH after liming to the protonation of variable charges and retention of positively charged hydroxyl-Al polymers. However, Ro and Cho (2000) observed that the formation of solid phosphate precipitates resulted in a lowering of soil pH due to H+ production in both acidic soil systems. During incubation, the levels of organic-P did not change in control and both CaCO3-treated soils. Several factors such as microbial activity, temperature, humidity, aeration, soil pH, and plant species are known to affect mineralization of organic-P and immobilization of inorganic-P. Mckenzie et al. (1992) found that an increase in microbial activity increased mineralization of organic-P. However, the relative contribution of these factors to the balance between inorganic - and organic-P forms remains unclear, since the mechanisms associated with dynamics of organic-P are difficult to determine due to the limitations in the available analytical procedures (Li et al., 2014) and the complexity of mineralization-immobilization turnover (Curtin and Syers, 2001). In this study, available-P was inversely related to liming (Figure 2C), and this inverse relationship was not consistent with the results of most previous studies. In general, available-P increased due to the application of lime (Fageria, 1989). However, Pailles and Moody (1995) demonstrated a strong negative effect of CaCO3 content on available-P in estuarine and marine sediments. In contrast, Chang and Jackson (1958) observed that the application of lime increased the level of available-P in high phosphate soils but not in low phosphate soils. Hence, the presence of a causal relationship between Ca2+ content and available-P in the soil remains unclear. Several investigations reported that the minimum solubility of P was attained in the pH range between 5.5 and 6.5 due to the interaction with exchangeable cations (Haynes, 1982). During incubation, the addition of CaCO3 caused an early increase in the levels of exchangeable Ca2+, Al3+ and Fe3+ ion species (Figure 3) due to dissolution of CaCO3 and the subsequent displacement of Al3+ and Fe3+ by exchangeable Ca2+ (Higgins et al., 2012), thus leading to a significant decrease in the levels of available-P (Figure 2C), due presumably to increased phosphate precipitation and/or adsorption reactions (Brady and Weil, 2010). Unlike the temporal variation patterns of Al3+ ions (Figure 3B), the initial increase in the concentrations of exchangeable Fe3+ ions decreased within 10 days of incubation and thereafter remained virtually unchanged (Figure 3C), indicating a probable formation of Fe-containing compounds. 4.2. Effect of liming on inorganic P speciation and mass-balance. 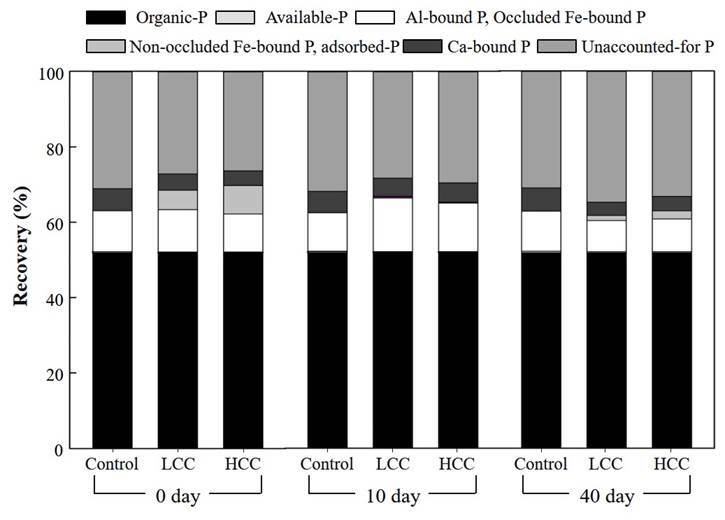 The levels of Fraction-A (Al- and occluded Fe-P) in both CaCO3-treated soils peaked at 10 days of incubation, and then decreased finally below the control levels (Figure 4A). The initial increase in the levels of Fraction-A during the first 10 days of incubation could be explained in two ways. One is the direct formation of the Al-P compounds as a result of a marked increase in exchangeable Al3+ due to displacement and the conversion of hardly extractable Al-P compounds, such as berlinites and variscites, into more extractable P forms due to an increase in the solubility with increasing soil pH (Lindsay, 1979). The other explanation is the direct formation of the occluded Fe-P compounds, which was evidenced by the concurrent decrease in the concentration of exchangeable Fe3+ (Figure 3C). For the decrease in the levels of Fraction-A in the latter part of incubation, however, we could not provide direct evidence and logical explanation. A possible explanation might be the conversion into hardly soluble Al-P compounds as indicated by the equilibrium constants under neutral or alkaline conditions (Lindsay, 1979) or into the non-occluded Fe-P compounds as shown in Figure 4B. 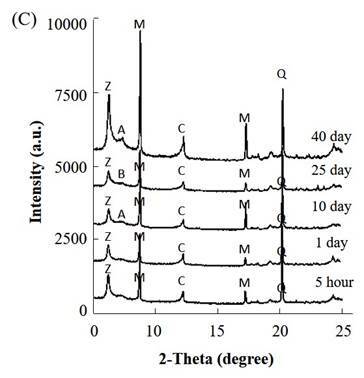 The initial increase in the concentrations of Fraction-B (non-occluded Fe- P and adsorbed-P) for CaCO3-treated soils within a day of incubation (Figure 4B) indicated an early formation of the non-occluded Fe-P compounds by precipitation with displaced Fe3+ ions (Figure 3C). However, we could not eliminate the possibility of the conversion of the occluded Fe-P forms into more soluble forms due to an increase in soil pH (Lindsay, 1979), since the levels of Fraction A (Figure 4A) slightly decreased during the same period. In the latter stage of incubation, the levels of Fraction-B slightly increased (Figure 4B) while those of exchangeable Fe3+ remained virtually unchanged (Figure 3C), and this phenomenon indicated the possibility of the conversion of the occluded Fe-P forms into the non-occluded forms, as corroborated by the concurrent decrease in the levels of Fraction-A (Figure 4A). Our results obtained for Fraction-C (Ca-P) did not follow the widely-held belief that the level of Ca-P increases with liming. During incubation, the levels of Fraction-C were lower in CaCO3-treated soils than in control soils (Figure 4C), and this could be ascribed presumably to the conversion into more stable Ca-P compounds (not extractable with the extraction scheme herein) as a result of extensive interactions of phosphates with more exchangeable Ca2+ ions. The initial decrease in the levels of Ca-P compounds with the concurrent decrease in those of exchangeable Ca2+ (Figure 3A) provided experimental support for the conversion into more stable and less soluble Ca-P compounds. In general, the solubility of Ca-P compounds in the soil decreases as the pH increases (Lindsay, 1979). It is well-known that Ca-P compounds, such as mono-calcium phosphates and di-calcium phosphates, are easily converted into less soluble P compounds in soils at neutral or alkaline pH or Ca2+-rich conditions (Tan, 2000). However, Pan and Darvell (2009) suggested that complete reappraisal of the Ca-P system should be needed to solve the confusion arising from our reliance on the reported solubility because detailed and accurate knowledge of the chemical equilibria between the solid phase and its solubility is lacking. Ro and Cho (2000) observed the initial formation of a very unstable amorphous Al-P [Al(OH)HPO4] and its quick conversion to another amorphous or crystalline precipitate as a result of a series of acid-base titrations. Tunesi et al. (1999) demonstrated that P added to calcareous soils was considerably insolubilized within 5 weeks due to the formation of insoluble Ca-P precipitates, suggesting that P availability is reduced for soils having a high reservoir of exchangeable cations by forming insoluble P compounds. However, we cannot proceed further because relevant information on the solid phosphates and their thermodynamic data that are essential to postulating the course of chemical interconversion processes are mostly unavailable in the literature. In addition, since the temporal variations in the mass-balance of each cation species (Al3+, Ca2+ and Fe3+) were not directly measured, we cannot fully explain the relative contribution of each cation species to the mass-balance distribution of each P species. Our approach challenged the widely-held notion that the portion of Ca-P (Fraction-C) and the availability of P would increase in the presence of increased exchangeable Ca2+ ions after liming. Our results consistently revealed that a disturbance in chemical equilibria right after liming resulted in an unexpected decrease in Ca-P and P availability and a concomitant increase in exchangeable Al3+ and Fe3+ cation species, which contradicts current hypotheses on liming and P availability. Furthermore, within a day of incubation, a decrease in Ca-P was observed with a concomitant decrease in soil pH (an indicator of the formation of precipitates in the system) and exchangeable Ca2+ ions, indicating a probable formation of thermodynamically more stable solid phosphate compounds (i.e., AlPO4) and their interconversions, as identified in the X-ray diffractograms. However, investigations about the quantification of the solubility isotherms of various solid phosphate compounds using acid-base titrations and the effect of soil types and soil fertility with differing organic matter content on the mass-balance distribution of chemical P species need further study with the aim of confirming our results.